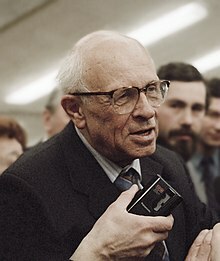 Andrei Dmitrievich Sakharov (Russian: Андре́й Дми́триевич Са́харов, May 21 1921 – December 14 1989), was a Soviet nuclear physicist. He was also a well-known dissident and human rights activist. Sakharov was an advocate of civil liberties and reforms in the Soviet Union. Sakharov was a very clever scientist. He graduated from college during World War II but was kept out of the Red Army to do scientific research for the government. Sakharov helped the Soviets develop the hydrogen bomb in the 1950s. But he also made many peaceful uses of nuclear power. The bomb he had helped make started Sakharov to be a dissident. He argued with Nikita Khrushchev against unneeded nuclear tests. He was afraid that these tests put people's lives and healths in danger without need. He began asking, too, for more freedom of speech. The government removed him from his secret work and his special job as a scientist. Sakharov began to see what unhappy lives most Soviet citizens led. Persecution only made him speak out more. He asked for more freedom of religion and defended others who had spoken out and been put into jail. The secret police began to watch him and to make files of information against him. After Sakharov criticized activities of the USSR's Arab allies, Arab terrorists came to his apartment and held him, his wife, and his stepson hostage for an hour. "Do you want to kill us?" cried Sakharov's wife. "We can do worse things than kill you," they replied. After the terrorists left without doing anything, Sakharov tried to tell the police about it. The police did not really care. The only thing that protected Sakharov was many people knew about him outside the Soviet Union. The Communists were afraid that if something happened to him, it would give the world a bad image of the USSR. But when Sakharov criticized the Soviet invasion of Afghanistan in 1979, they became very angry and took him to the city of Gorky. There he was watched by the police outside his apartment. He tried to go on a hunger strike, not eating anything. The Soviet Union was afraid he might die, so they force-fed him (forcing him to eat). Sakharov kept on asking for glasnost (openness). In 1986, Mikhail Gorbachev, who agreed with Sakharov and thought there should be glasnost, let the dissident scientist return home. Sakharov continued to call for reform, and in December 1989, he died of heart failure, at the age of 68. . But two years later his wish became true with the dissolution of the Soviet Union. .
↑ 1.0 1.1 1.2 1.3 1.4 1.5 1.6 Koontz, Terri; Mark Sidwell, S.M. Bunker. World Studies for Christian Schools. Greenville, South Carolina 29614: Bob Jones University Press. ISBN 1-59166-431-4. This page was last changed on 4 February 2019, at 22:43.